to take thee back to thy kingdom. “Fair maiden, do not take a fright. that month, that year, that century! © Alfred W. Smith Jr.
“We’ve got t’leave,” said Orliss. He spent the rest of the day packing what he needed for the road. Being a hermit, of sorts, there was always a travel bag at the ready. He opened Meralys’ closet to Jaika; nothing was an exact fit, so she took what felt snug, and left the rest. There were also riding clothes, an unexpected and welcome bonus, so she took those as well. “We was farmers once, and Meralys loved ‘er horses,” Orliss explained. He still called her ‘missy.’ She’d given up trying to change it. Besides, it could also be her name; no one need know her real name here. As of now, only two men who’d she’d had no intention of meeting, and had stumbled into quite by accident, knew it. And then she received another startling revelation, from none other than Orliss himself. She looked up, surprised, a smile of shocked amusement on her face. “Your accent’s a ruse,” she said. She nodded, and couldn’t repress a shudder, which he saw. She sighed, and composed herself. He placed a meaty hand on her shoulder. “I know. You’ve been swept up in a series of events that make absolutely no sense to you. I can’t explain how they do. I don’t know why you’re here, or why Dominick is after you, or me, for that matter. He won the war when he killed Meralys, and I was too devastated for thoughts of revenge. “But I let him take the woman I love from me, and did nothing about it. “I can’t allow that to happen again, but I can’t promise you it won’t. “The truth is, the years of dissipation were real, and have taken their toll, but now there’s what’s left, and I have to use it to rid the world of him, and not just for you. I don’t know the part you play; I’ve read no great books, and there’s no ancient prophecy. His hand was still resting on her shoulder, and she put her own hand over it. They left the cottage empty and set out for the town to buy horses. Jaika had to admit that in her travels, she’d never met anyone like Orliss. There was more to him than met the eye. He’d been stinking and drunk, and she’d been violent and desperate and frightened out of her wits, and in a few days, they’d become totally different people, though she was still frightened out of her wits. Her travels up until now had been solitary; she slept when she needed to, ate when she was hungry, and traveled often to the point of exhaustion, wandering, seemingly aimless, but now knowing it wasn’t. None of what happened to her now seemed coincidental, but she hoped she wasn’t some sort of celestial pawn, even though the darkly divine nature of her encounter was already a factor. Gods of the forest, is that why you removed your protection? If so, you’ll not find me a willing puppet to your unknown plans. The bargain for horses struck, they rode back on the dirt trail that led to the temple. “I’ve not seen it in many years. I went as far as the tavern, and it seems the devils were content to leave me be, after they destroyed me. They arrived on the temple grounds. It sat in the middle, a circle of smooth walls like an aged, empty turtle shell. The ivy leaves were beginning to turn with the season, as were the trees, edged with the slightest of red and orange and gold. We must kill him before winter. She stayed at the top of the trail, holding the reins of their horses as they grazed, and Orliss investigated. There was no way she could bear to go near it right now; it was enough she might have to later. He peered through the cracks, same as she did, but he didn’t stay long to observe anything, or so Jaika thought, as he walked around it rather quickly for his size. She wanted to call out, to ask him if he saw anything, but the demon priest might not necessarily be nocturnal. Orliss stopped, seemed to be thinking of something, then walked toward the back of the temple, but instead of going around again, he walked through the high wild grass. Jaika only saw trees and weeds. It seemed to her there was nothing to mark it as a path. Curious, she dismounted, tied off the horses, and went to follow him. He was standing at the edge of a cemetery, the stones faded, fallen, and the gates broken. There was a low-lying fog covering the grassy ground, burning off slowly in the mid-morning sun. She came and stood next to him. She pressed no further, and let him have his moment, and started to walk back toward the horses. She’d learned that when he called her name, things were different, so she stayed, standing beside him, scanning the mossy, discolored markers. She went quiet at that, put some stray strands of hair behind her ear, losing the set of her shoulders, sighing. He turned to face her. His eyes held a tenderness, but also a glimmer of fire. Jaika didn’t want to know, so she asked no more questions. He sat on the stained marble bench, and closed his eyes. Jaika took the quiet time to look around. The gravestones, faded with age and stained with elements, listed precariously in their slots, all but toppled, the names and dates long obliterated. The high grass extended all across the plot land, and the mausoleum sat squat and dark, a diseased mushroom full of decay and vermin, a black blot on the green field. She shuddered. There was something tainted and palpable in the air, like demon breath. Orliss, some memory tapped, began to chant in a soft voice that pushed against the silence, chipping away at it. Jaika didn’t know if he was praying, or casting a spell, but either way it looked like he would be a while. She went to check on the horses, and stayed with them to reassure them that their riders were still close by. She ate a small snack while she waited. The fog had burned off, and the mild warmth and clear skies of the early afternoon belied the peril they faced, and as the morning lazed into the afternoon, Jaika saw spread through the fading mist where Orliss sat. The nervous horses whickered and stamped, and Jaika moved out of the range of their hooves. Fighting panic, her hand trembling, she drew her short sword, and went to investigate. Orliss was where she’d left him, but what was in the light got her attention. There were people, hundreds, of all ages, standing by their markers, but something about them was very strange. Jaika realized that their features were just the veneer over their bones, and the wounds and diseases that ravaged them were visible: there were murder victims , their ghastly wounds almost translucent in the afternoon sun. And of those who were mutilated: she could see their severed limbs flickering where they’d been hacked, the bloody stumps of meat and gore still dripping spectral blood. Those who’d died of diseases, in childbirth, in accidents, all bore the marks of their passing, she saw the skeletons just underneath the veneer of flesh. The people were buried dressed in their finest formal wear, which was now little more than scraps, hanging like dead creepers from their limbs. Sunken eyes, missing teeth, swollen tongues, open sores, torn female clothing, bruised faces, tilted heads with rope burns on their necks, and heads of glorious female hair ridden with lice, and small children with smiling mouths full of worms and centipedes pushed back against Orliss’ magic with a palpable malevolence. He might have been marble himself, though his whiskers flew about him like a halo of tumbleweed, and sweat stains ruined his clean clothes. Vermin began to appear and tentatively sniff at him, and began to snap at his flesh. They went right through Jaika, as if she wasn’t there at all. He flinched, and winced, and gasped, but picked right back up and didn’t stop chanting until, finally, he did. As he stood, he brushed the vermin from his body with a fell sweep of his arm, and Jaika gasped as they vanished. It had all been illusion to get him to stop. A spirit-man came forward, his transparent flesh desiccated, and pointing what was left of his finger at Orliss, he spoke telepathically. Jaika heard his voice in her head; it sounded like wet, shifting gravel, grating and unpleasant. She bore it for Orliss’ sake. You should be here among us, priest. We could make it so you are. If we did, we would not tell you, for your magic is weak, and cannot compel us. But it is as you say: we know not where he has gone. Why do you disturb us, Orliss? A woman’s voice was speaking now, as she made her own way to face him. Have any of among us haunted you? Then why do you seek us? “This is my friend Jaika.” He extended his arm in her direction, and their broken eyes followed it to land on her. Jaika tried not to tremble. ” Thonian has marked her for his bride. I cannot allow it, and in the process of stopping him I might…I might be able to…free your souls. The outburst was immediate, with some opting to pass through him and kill him, and still others to finish hearing what he had to say. This is a bold claim, from a man whose magic has passed into legend. Along with our souls, you mean? The woman spoke to them both, not unkindly. The staring seemed an eternity. A breeze stirred, and Jaika gagged on the stench from the risen dead, and held her breath; if either of them said anything now, they would lose their cause. The two spirits that spoke to Orliss conferred, then walked among the others. The early afternoon went into the late afternoon by the time the two of them returned. Yes, Orliss. For the sake of our souls, we’ll be glad to help, but if you fall into the river of doubt, the stream of surrender, your souls are forfeit to us. Orliss looked at Jaika, and after considering, she gave him a nod. Then we take our leave, until tonight. They slipped back into the ground in clusters, angry at their awakening, but excited to be involved in what could be the ancient land’s new beginning. © Alfred W. Smith, Jr.
in her everytime she saw a leaf fall. How she hated the cold months. Coming with their inevitable fury, trapping her. She would bundle up, drink coffee, anything to try and stay warm. But somehow, they always got through her defenses. Catching her up with their swirling winds, nipping at her. and they would laugh at her. Caught up in the majesty of it. Calling her. Haunted by the wind’s lyrical melodies. Calling her. And the winds would die. And the snow would drift gently. She was held in reverence here. They always had to remind her. In the early afternoon, Echo felt the cool grass under her bare feet, and her white diaphanous dress barely hid her charms for modesty. She gazed about in amazement, looking for Time, who’d manifested himself to her in the form of a sculptor, and barely pushed her through time before Death’s gory scythe claimed their lives. She dismissed the thought; it was enough that she was free from the rocks that imprisoned her in her grief all those centuries ago. The gods had long ago abandoned the region, and her, and the rains had stopped, leaving the land to change to desert, and her alone inside her stony dungeon; she no longer had the luxury of even repeating the words of someone else, and her loneliness crushed her spirit as she slept, and woke to silence, and slept again, in a cycle of living death. And then the netherworld travelers happened to stop in front of her. Breathing in the fresh clean scent of the forest, even in its pungency, made her shiver with pleasure at life once more. She wanted to kiss Time again; his scent had stirred her, but he’d hidden himself. Maybe there will be…time…for that later. Her mischievous thought brought a smile to her lips when she heard someone rushing through the woods in her direction. Before she could hide, the figure emerged; it was her King, flushed, panting, and looking over his shoulder as if a wild boar pursued him. She took the knee before him, and he paused a moment in front of her. “I would, had I time.” He smiled at her with lust, but time was of the essence, and he’d sated himself elsewhere. “There’s a good nymph.” His hand cupped her cheek in a mix of paternal affection and a lion testing the softness of the skin of its next kill. There was a rustling behind them, and Echo wanted to laugh as Jupiter bolted like a frightened deer into the woods to escape Juno’s wrath. The scent of lilac wafted in the air, and Echo walked toward the blooming bush, and gathered some in her hands, letting the scent wash over her, as Juno came from the same direction as Jupiter, her eyes sparking with fury, her nails digging into her palms. She spied the nymph by the lilac, and rushed over to her. “I have sat at your feet, and eaten from your hand. I live at your pleasure, and die at your command, and my queen has been most gracious not to seek my death. I would not risk such by bedding your lord and husband, though he grow angry with me, and threaten my life. Some of Juno’s steam began to dissipate as her gaze scanned helplessly around the woods; it seemed he’d eluded her once again, and her eyes began to shine with welling tears. Echo surreptitiously cast about for Time once more, but he was not present. They spent the afternoon together, and Echo chattered away; her knowledge of the woods and all therein was extensive, her curiosity about matters royal always favored Juno’s views, and as the sun wheeled to the chariot house, they gathered the lilac, the yellow posy, blue periwinkle and daisy, and Echo wreathed them round, and crowned Juno, saying she was now a nymph, and had to stay in the forest where Echo could teach her all there was to know. Juno laughed, and Echo laughed with her, not like her. And so the afternoon went, until they came to a clearing, and sleeping by the base of a tree, was Jupiter. Both women stopped in their tracks, and gazed upon the sleeping man, clothed only in a loincloth, his royal vestments left wherever the pool was that he’d indulged himself. Juno turned to Echo, who in trying not to reveal anything, revealed her guilt. 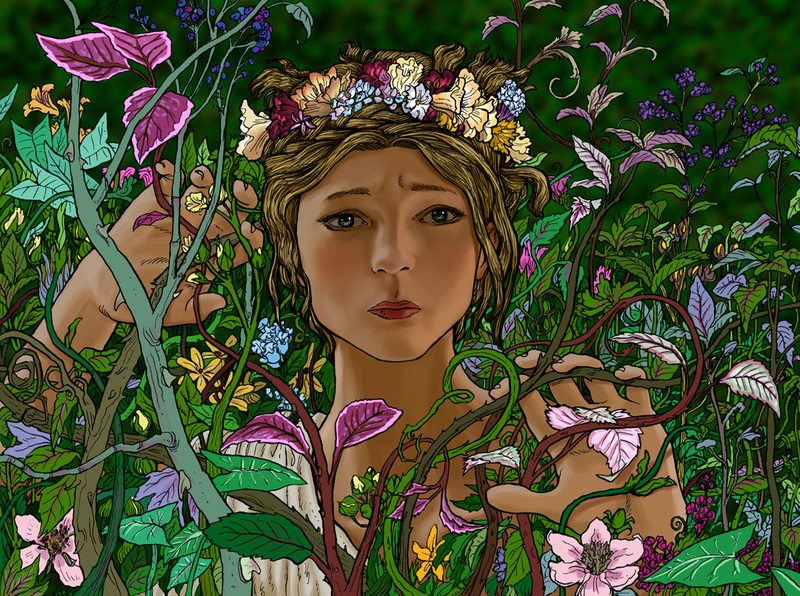 Slowly, Juno took off the crown of flowers, and her arm flashed, and she caught the nymph across the cheek, knocking her to the ground in a spray of blood and blossoms, her dress now immodestly gathered about her as she scuttled along the ground as Juno bore down on her. Echo closed her eyes, Time forgotten, reliving the horror of the day of Juno’s curse, unable to scream, or plead, or move, she lay like a newborn babe before a ravening wolf, and suddenly Juno shimmered, and stood still, immobile as Gorgons’ men, yet not of stone. Time stepped from the woods, and at first Echo was uncomprehending; then she began to realize what had taken place, and slowly, she got to her feet, and walked over to him. He’d aged more, his rounded frame now thinning, his beard, neat and trimmed, salt and pepper, was now ragged, stained and unkempt. His eyes, sharp and keen when he sculpted (for she’d looked deep into them as he cut her out), were now almost rheumy to the point where she wondered if he was blind. “This is my gift to you,” his voice rasped in her ears. “You’re giving me back my voice?” Her eyes welled up in wonder. “It is better to die than to never speak your own words,” said Time. “What will happen to them?” her gaze took in Juno and Jupiter. Echo ran to him, embraced him, ironically now speechless with gratitude. She looked into his eyes, and saw the light go out; he was truly blind now. Death had his shroud; he didn’t bother to tell her he would not make it back to save himself. He’d answered her question now: Time could be killed or saved, redeemed or spent. She found that she had a choice to make, and with her heart quailing inside her, she made it. Death and Time were walking through a mountain pass in the waning light of a westering sun, a path they’d walked many times before. As he walked, Time cycled between youth and age, but whether he skipped with youthful exuberance, or hobbled painfully along on his walking stick, Death’s tread was ever constant, and eventually, he would catch up to Time. Whenever Time stopped to rest at the end of his age cycle, Death covered him with a new blanket, until the child shaped re-emerged, sticking out its tongue at Death, sprinting away as fast as it could, and Death would take the remains of the blanket, now full of holes and moth-eaten, frayed and rank, and pack it away in a satchel he kept on his back until the next cycle. 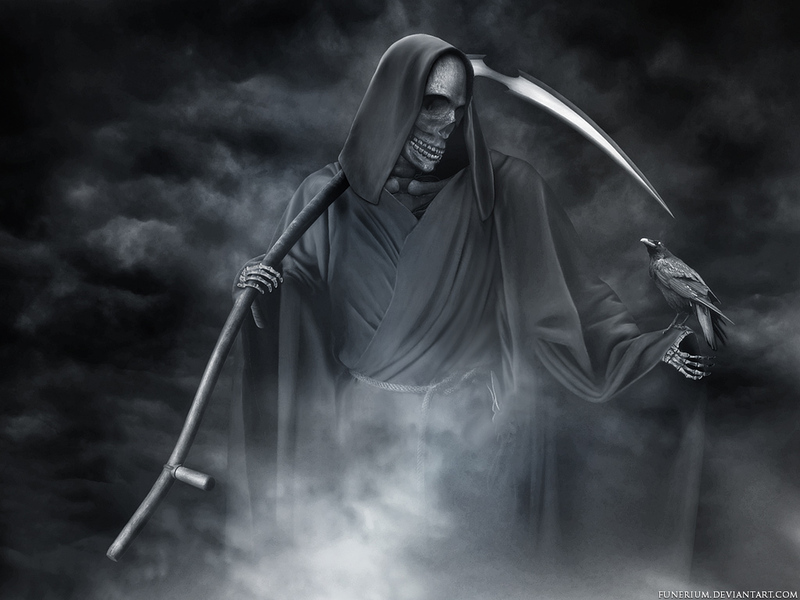 And Death would rise, patiently, and plod behind, the mountain winds snapping at the hem of his black and crimson robe, the bone handle of his scythe, serving as a walking stick, making puffs of dust, or crunching gravel, or click-clacking on stones, or making divots in the soil, depending on the paths they walked that day. His rhythm never varied, but seemed random somehow. Time never waited for Death, but Death always waited for Time, though there were moments Death grew impatient, and pulled Time along before he was ready. Time wept the hardest when Death took him away, because sometimes he simply wasn’t prepared to go; there were more memories to share, more places to explore, but Death would not hear his pleading. It didn’t matter to Death; his world was ever silent. Where Time saw colors and seasons, meadow and river, flower and tree, birds and animals of all kinds, heard their songs and braying, saw them breed in the spring, saw them in the fullness of life and strength and beauty, Death saw only bones, twisted trees and blackened flesh; the only splashes of color in his world were scarlet and sepia, which turned to black when what he’d seen centuries before passed from being merely old into ancient, and from there began its long, slow descent into the Mire. Death and Time worked in tandem then, to nourish the earth and comfort the living, but other than that, they went in slow, seemingly senseless circles around the earth. These circles they made by land, walking trails or in the backs of wagons, tracking the migrations of animals, the turning of seasons; by air, flying through the dark, spinning inside the maelstroms of calamitous storms of rain, or sometimes, sand; by sea, riding the backs of drifting clouds across oceans and continents, Time all the while proclaiming what would be, and Death, watching, waiting, to proclaim when it would not. Time was cycling now, coming out of the uncertainty of musky puberty into the more mature stability of manhood. 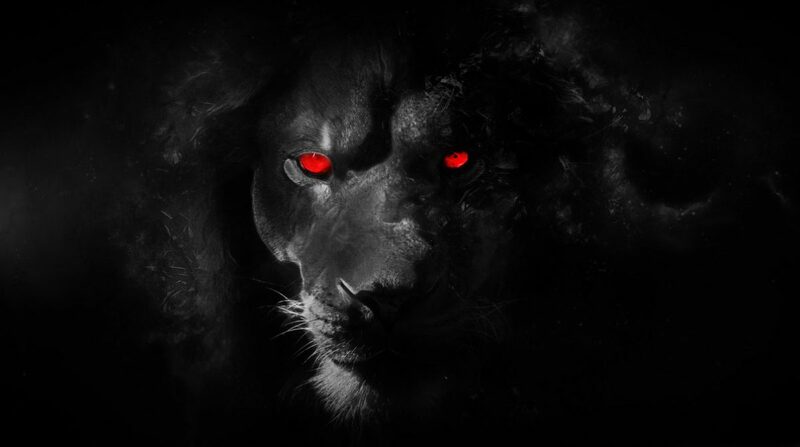 His whiskers grew full and shiny, black as crow feathers, black as Death’s Mire. Through a trick of the light in the shadowy canyon, Time saw a face inside the rock. Death, if he were capable of it, would’ve given a smile. His bony arm swept in an expansive gesture, his finger pointing to the setting sun to indicate the twilight shadows playing tricks. Death took out a broken hourglass; the sand sloughed off his fingers, and the shards of glass glistened like iced tears in his ivory palm as he slowly shook his head: No time. Time threw back his head and laughed, and the canyon echoed, and so did the rock face beside him. Death and Time stared at it then. It had moved ever so slightly, its mouth barely a gash, and laughed as Time did. “The rock is enchanted,” Time whispered, and the rock whispered it too, softly, but there was no mistaking it this time. A chisel and hammer appeared in Time’s hands, and with great patience and skill, he cut around the contours of the rock, following its grain. Death gave up all hope of moving, and walked off, his walking stick scraping in agitation at the packed dirt. There, in the valley below, by a dried up crater that once contained cool, still water surrounded by willow trees, a withered flower had grown through the bones of a man who died with his arms outstretched, as if embracing something that had pried itself from his desperate grasp. The flower was where his heart would’ve been in life. Ah, Death had known him. Time’s whiskers, glossy and black in the evening, were now streaked through with white, and his body was becoming a bit rounder, his face a bit more full, the hard angles retreating. The moon rose, full and pale and high, and clusters of stars glittered and flashed like celestial fireflies. The figure was indeed a woman, and by the light of the moon her stony appearance melted, to reveal beneath its hardness a woman of great beauty, stunned by her new found ability to move and feel once more. 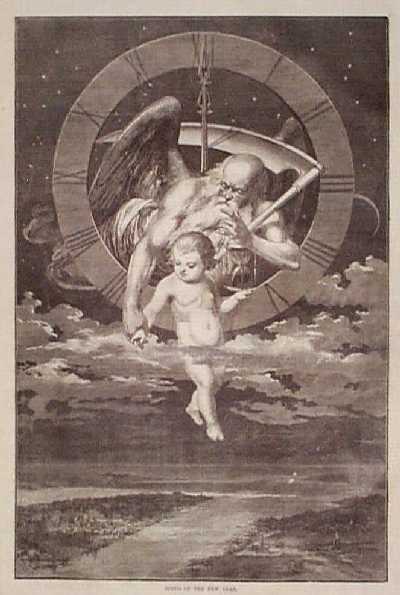 She touched Time’s face with a grateful hand, and kissed him for a long time. He eagerly returned the embrace, and parting breathlessly, he thought she would thank him, but she did not. As she gathered herself, he questioned her. “You talk?” She patted his chest, shaking her head in frustration. Time seemed amused, but she wasn’t; she was trying to tell him something, but could not seem to get it out. She only repeated what he said, and in time he realized. “Yes, yes, all right then.” He tried to take her hands down, but she clutched at him and would not let go, but he finally got her in a firm grip, and lowered his head, and looked into her eyes to calm her. Her manner was of a bird, set free from its cage, which could only walk trustingly into a waiting hand because it couldn’t fly. She seemed to settle, and held his gaze, her breathing slowing, her liquid eyes large and luminous in the lunar light. “You’re so beautiful,” he whispered. “You’re so beautiful.” She smiled, and put her hand to her mouth, blushing. Time also smiled at the unintended compliment, and then shook his head, frustrated now as she was. Death grew tired of waiting, and they could hear the skritch of his walking stick scythe as it scraped the path, and emanated from Echo’s slightly parted lips. Behind them now, he looked at Echo, and her skin went from blush to blanche. Time turned to look, and keeping one face on Death, made another to look at Echo. “Not here for you.” Her face twisted, as if with a bitter memory; he saw the agony in her eyes that she could not speak on her own. Time straightened his stance, and put his hands on her shoulders, looking down at her. Death was no longer motionless, however, and upended his scythe, and Echo fidgeted under Time’s hands again. “Do you understand?” she was nodding again. Death’s scythe descended, but seemed to slow the closer it got to cutting them down. As it whisked through where they’d been standing what only seemed like an instant ago, Time disappeared. And there was no echo. Dedicated to the indomitable spirit in all of us. In the halls of her school, Lisa heard the comments. Her face would heat, and she’d roll the chair a little faster, enduring the day, the comments sown like bitter seeds in her heart. Time was against her; her muscles hadn’t failed yet, but they were on the way. She sighed, but today, she managed not to cry. Her father loaded her like a cargo of five gallon drums into the back of the van after school, and took her home. She did her homework before dinner since there wasn’t much. Her parents were watching television when she rolled the chair in front of them. “Lisa? What is it, honey?” her mother said. “No!” She slammed her fists on the arms of her wheelchair, and her parents jumped. She got her breathing under control, kept her eyes averted to blink back the tears that threatened; if she cried now, it would be over. She looked up at them in after a moment, her eyes clear, her gaze steady. Huffing in frustration, but without another word, her father clicked off the tv and loaded her into the van. Her mother rode shotgun, and they rode in silence. The dance class stopped when Lisa came to the door. Lisa rolled the chair past Mrs. Castro. The other girls watched in stunned silence. Stopping before the mirror, Lisa took a good long look at herself, taking stock of what she was about to do, and whether or not it was worth it. 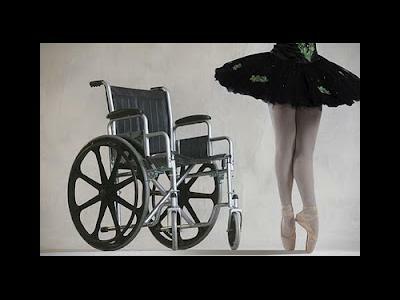 And she turned the chair sideways, placed her feet on the floor and placed her hands on the barre, her breathing deep. The other girls watched at first, as her arms began to shake, her knuckles tighten and slip; she wiped her hands on her useless knees, and got another grip, and pulled again. And little by bit, Lisa began to pull herself up, trembling, shaking, but slowly rising. “Lisa, don’t do this,” her mother said, her hands over her chest. “Lisa, stop!” her father said. She bit her lip as the tears stung again, and one escaped, and she rose a little higher. With her next pull, she gave a small cry of pain, and one of the girls broke from the circle and got behind her, and put her arm around Lisa’s middle, supporting her, her knees and thighs aligned with Lisa’s own, which were almost like a marionette’s, and she pushed the chair a little distance away.Lisa went higher, her breath hissing between her teeth. The girl behind her was straining with the weight, and she didn’t want to fall backward. Another one joined her, and stooped to put Lisa’s hands on her shoulders as she supported Lisa’s arms. Lisa went higher, even as the pain ripped through her and she cried out again. Two more joined and supported the two girls who were holding Lisa. She went up a little more. And another came, and another, and then the rest, reforming the semi-circle that had been around Mrs. Castro, and they began to call out. “Spin faster, stupid!” They all laughed a little louder at that, and Lisa strained with the effort. The girls began to cry through their smiles as Lisa struggled, inch by inch, her own cries lost in their laughter and shouts and cheers of love that sounded like reprimands they’d all heard and said, standing together back then as vulnerable and fearful children, standing together now as vulnerable, fearful young women with confidence and hope. And today, centered on their broken, fallen angel, they anointed her with all they had, and it filled the studio like morning vespers. And when Lisa finally stood, leaning on their arms and shoulders, wracking, drenched, and beautifully terrible, still shaking, crying and trembling as they embraced each other in bittersweet victory, it was for different reasons. “Sayest thou so? But they are beautiful: they are surpassing colorful, fragrant beyond compare! Add but a little water, a little light, and long will they last for thee. His hand she kissed, and filled his eyes with hers. “And yet they will fade and die: the petals grow dull in brilliance and fragrance, the leaf curl in upon itself, and black death, like a creeper worm, shall decay all of a once vibrant bloom; I would not have it so for love. “For in the soil are they rooted, their tender beginnings delicately intertwined, to help, nurture, assist, and lift the first tender shoots of love upwards, even as they descend to take what is needed to live, and to grow, and then, to grow strong. “There is no anchor for them in water alone. All the more are they rooted in the very essence of Creation, and from there, do grow to full height, despite the sorrow of storms, the plucking and plundering of bird, bee, bug and butterfly, the high heat of a sometimes overbearing sun, and the random whip and toss of whimsical, tempestuous winds. “There, in the field, their colors fade not until the proper time, in the fullness of their season, where they expire together in their full glory. “There, they take what they need, and in the taking, give freely and with purpose to bless and increase the stock and store of all who need them. “There, in the wild and verdant field, their perfumed prayers of fragrance fill the world and heaven both night and day without ceasing, and in the turning season, they press, with gentle touch, the essence of their scented offering into the seeds to come after. “That, dearest, is how our love, like flowers, should be as nature; and be they gathered into any hand, let it be only the tender fist of their Creator, there to scatter them across the spans of seas to all who love.